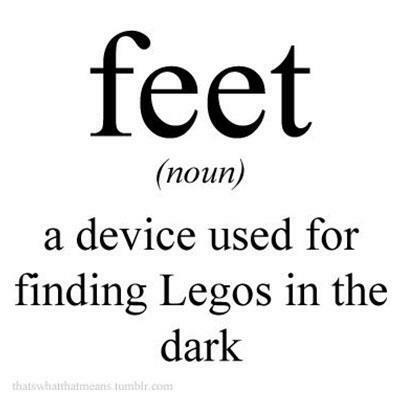 Feet - A Device Used For Finding Lego's In The Dark! 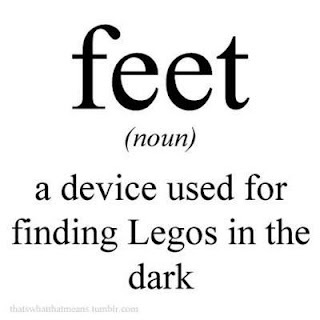 I have to say, one of the best and worst toys out there for us parents has to be Lego's. Now don't get me wrong, I don't hate Lego's, I remember playing with them a lot when I was a kid. Let's just all be honest with one another, every one of us has either stepped on them (mostly in the dark, but there are those times when we step on them during the day, lol!) or hurt our feet because of them. That's just the down side to having them around the house. Now does this stop us from buying them?! No way! Why? Because Lego's are a great way to help our kids learn many different skills, helps them to be creative and also helps them with teamwork when playing with others. So stepping on them in the middle of the day or night is completely worth it to me. Over the last couple of months both my kids have been into Lego's and I'm pretty happy that they both are. My daughter has always had a love for them, but my son has just now starting to really get into them and it's pretty awesome. They can spend hours playing together or even by themselves building something with their Lego's. Not only can I get a few things around the house done, but I love that when I ask them what they've built they can tell me their entire creation and the story that goes along with it. Right now over at Chapter's Indigo they're having a special offer where you can purchase any of the Lego's for 20% off. How great is that? Now you may know Chapter's Indigo for their books, but they also sale a number of different items including quite a bit of toys for children. I love that there are so many different themes and types of the Lego's. 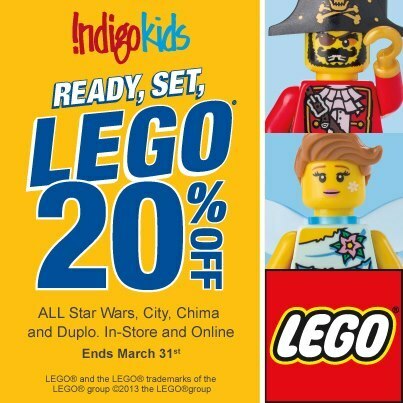 You can get Lego's in Star Wars, mini figures, Teenage Mutant Ninja Turtles (one of my daughter's favorites), City Lego's, Duplo Lego's, which my son loves, he has the Cars 2 one and there are even Lego Books for your child too. I'm pretty excited to share this deal with all of you Just Us Girls readers, but don't wait too long to get your savings, the deal comes to an end at the end of the month, March 31, 2013. Disclosure: All opinions are my own. This is a sponsored post, compensation was received.